Betal told Vikram, "You are a brave warrior, but let me tell you the story of a brave boy." Once there lived a king called Jairajan. One day he discovered that his relatives were planning to steal his throne and kill him. To avoid bloodshed, Jairajan gave up his crown and went to live in a far-off village . Here he married a girl and started living happily. One day, while returning home he saw a pile of human bones lying on the path. Shocked, he hurried back home and told his wife about the incident. She told him that the wicked king of the kingdom was sacrificing young boys to the eagle, Garuda. 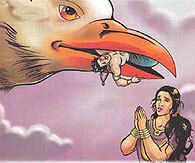 Jairajan found out that the next time, a boy named Shankar was going to be fed to the eagle. He met Shankar's parents and offered to sacrifice his life instead, though Shankar protested. On the day of the sacrifice, Garuda whisked Jairajan away. Shankar risked his life and ran to save Jairajan, but he was killed. When the news reached Jairajan's wife she begged Garuda to return her husband. Seeing her devotion, Garuda gave back Jairajan's life. Jairajan now prayed to Garuda to revive all the other corpses. The eagle fulfilled his wish. Now Betal put forward the question, "Whose sacrifice was greater, Shankar's or Jairajan's?" Vikram promptly replied, "Shankar. Though he was a mere boy he volunteered to sacrifice his own life." Since Vikram had opened his mouth again, Betal flew away.